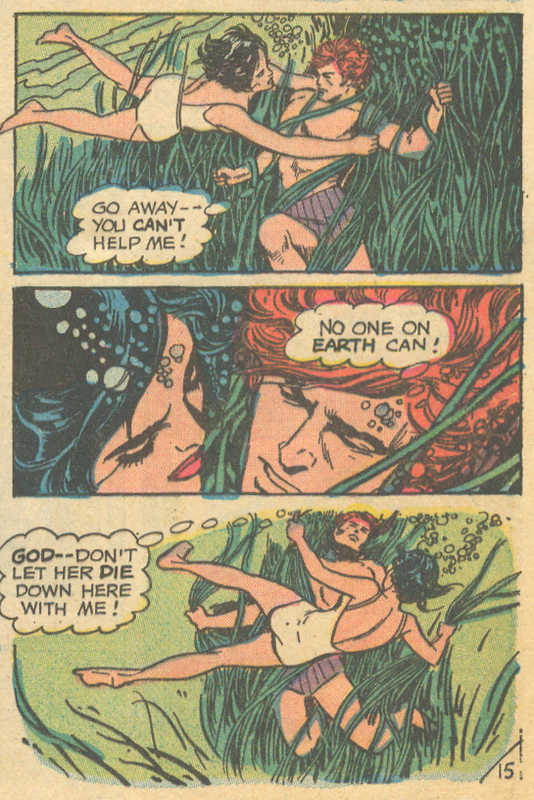 If there was a contest for most bizarre romance comic book cover scenarios, the cover of Young Love #104 (June/July 1973) would certainly be a top contender. Lee, a former soldier who served in the "murderous jungles of Nam..." has a difficult time readjusting to civilian life in every aspect -- romance included. Despite frequent dates with gorgeous women, Lee is never able to fill the void. That all changes when one night, Lee takes his motorcycle out for a ride in the country to get some air. He comes across a lovely young woman in a white bathing suit swimming. Intrigue instantly washes over him. In attempt to find the mystery girl, Lee checks into the Lone Lake lodge where he believes she is staying. The next morning in the dining room Lee spots her, but she coolly rebuffs his attempts at small talk with complete and utter silence. Suzan Dale, the hotel's receptionist takes an instant liking to Lee. She cannot seem to get his attention though, for he is on a mission to capture the heart of mysterious Theresa Brand. After the unsuccessful encounter in the dining room, Lee goes for a walk. He stumbles upon a man attacking Theresa and quickly steps in to take him down. A fight ensues and Lee puts the guy in a choke hold, nearly killing him with his bare hands. Theresa insists Lee stop -- which he does before going further into the woods to be alone. After sitting on a log for hours, Lee is suddenly pounded on the head from behind with a tree limb by the guy who attacked Theresa earlier. As he swings at Lee he yells, "You caught me by surprise before -- I'll crack your skull wide open -- tough guy!" Theresa appears and fends off the guy and comforts the bleeding Lee. 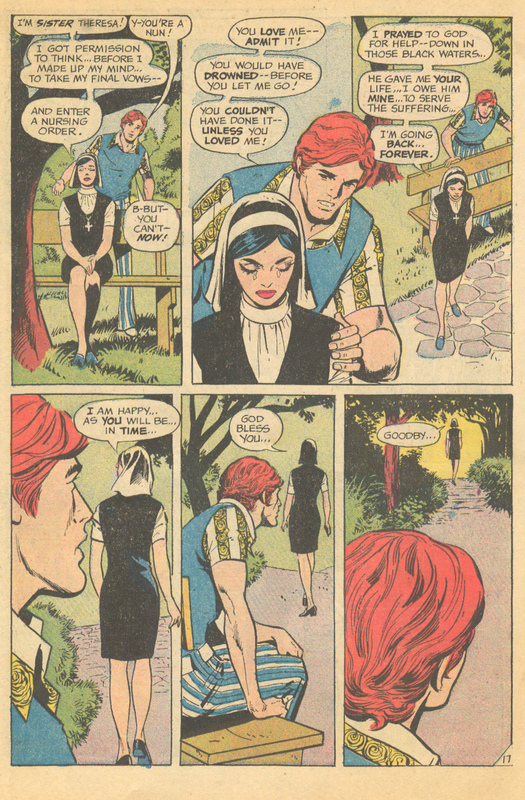 Theresa tells him that she is a nurse and will take him to the infirmary for a checkup. Lee's admiration for Theresa is only increased by her kind and caring attention to his wounds. Before the day ends, Lee tells Theresa he is in love with her. Silently, she walks away. The next day Lee drops by the dining room to find Theresa. Suzan lets him know that Theresa skipped breakfast and was down at the lake swimming. Lee quickly changes into his swim trunks and heads on down to the lake. Once Lee arrives, he realizes he is on the wrong side of the lake and decides to take a short cut by diving and swimming out to her rather than walk around the long way. Lee misjudges the dive, and winds up caught at the bottom of the lake in a mass of thick weeds. As he struggles to free himself, Theresa swims down to help. Things look grim, but Theresa eventually frees Lee and brings him to shore. Thankful and even more in love than ever, Lee tries to convince Theresa that his rescue was a miracle and therefore they belong together. 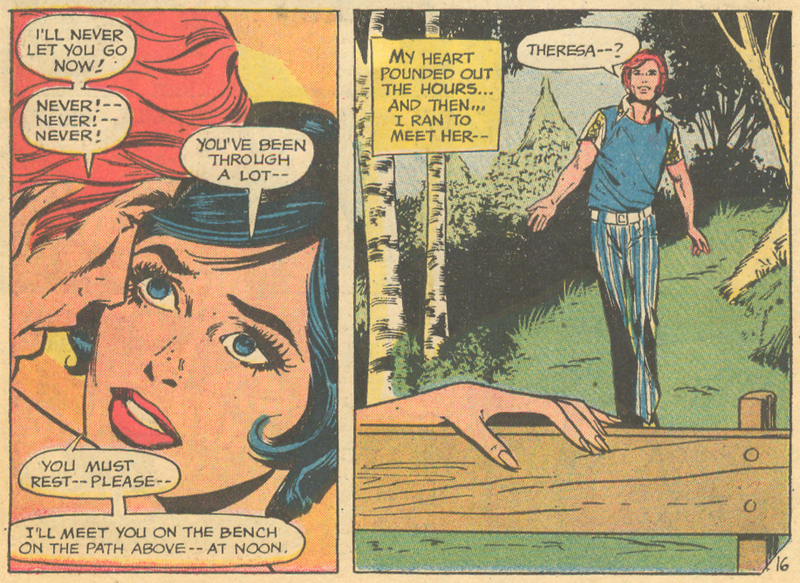 She tells him to rest and meet her at the park bench at noon. Lee complies with Theresa's request and meets her as instructed -- only to find out that she is Sister Theresa! Now, I know you saw that coming, but for Lee, Theresa's reveal comes as quite a shock! Quietly and with a gentle, "God bless you..." Theresa walks off into her new life. Lee sits on the bench for what seems like an eternity, alone in his confusion. Somberly, Suzan appears to comfort Lee in his time of need. Despite the slightly humorous cover, the 18-page "Veil of Love" is actually quite a sad and tender story. Both Lee and Theresa were looking for a connection. For him -- an emotional one, and for her-- something divine. The young nun seemed to have found her peace, but only one's imagination can determine whether Lee discovered his. *The creative team that would later go on to create the equally as unusual romance story, Lady Cop! 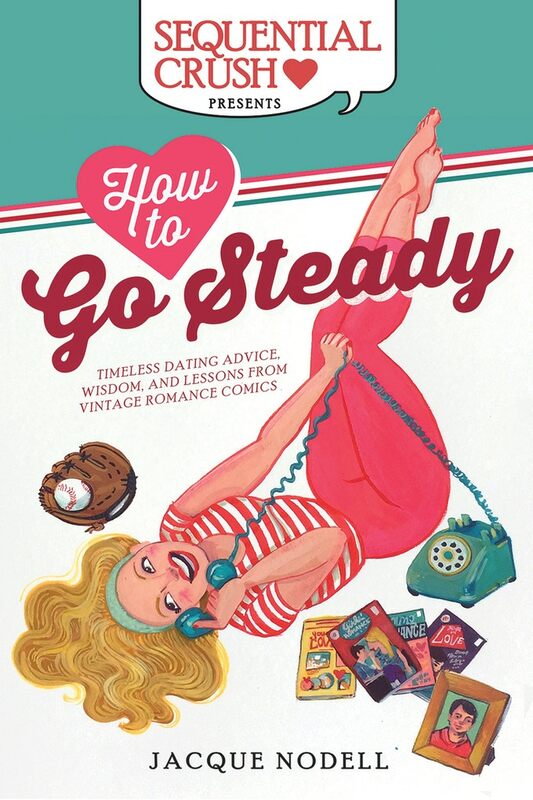 For more insight on how young men dealt with heartbreak in the romance comics, check out my book How to Go Steady! DC House Ad - "The First of Many Breakthroughs in Romance Mags!!"